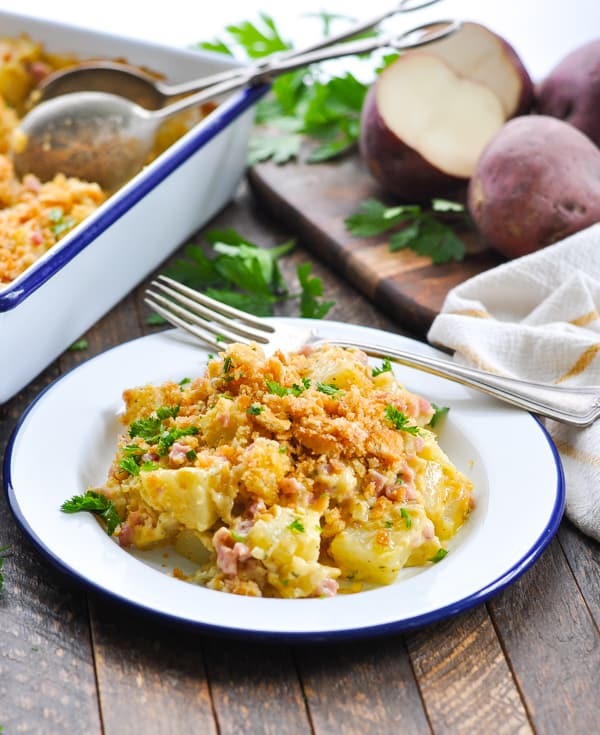 This easy ham and potato casserole is a perfect one dish meal for busy weeknights! 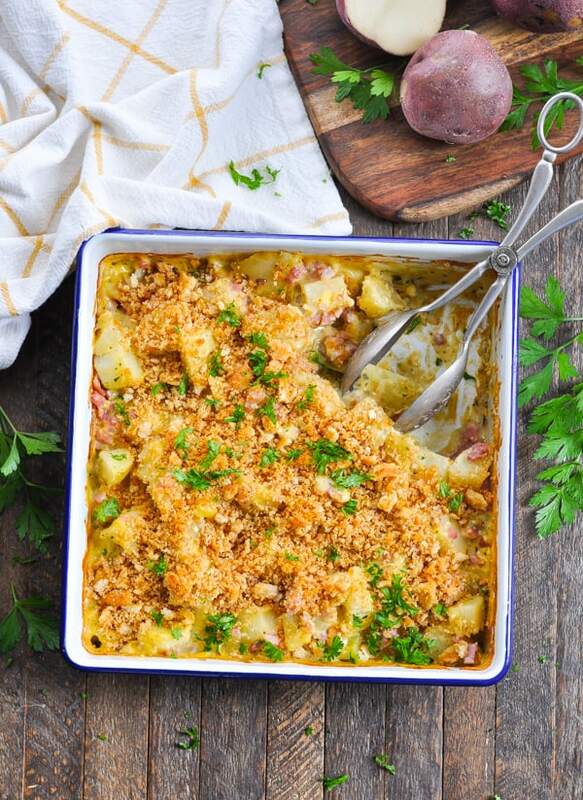 There’s no prep work necessary for this Dump-and-Bake Ham and Potato Casserole! Just stir together the ingredients and pop it in the oven. Your hearty, cheesy, satisfying one pot meal will be ready in about 30 minutes! Oh my goodness, y’all. 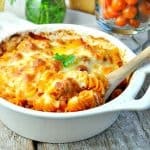 This meal is total comfort food! 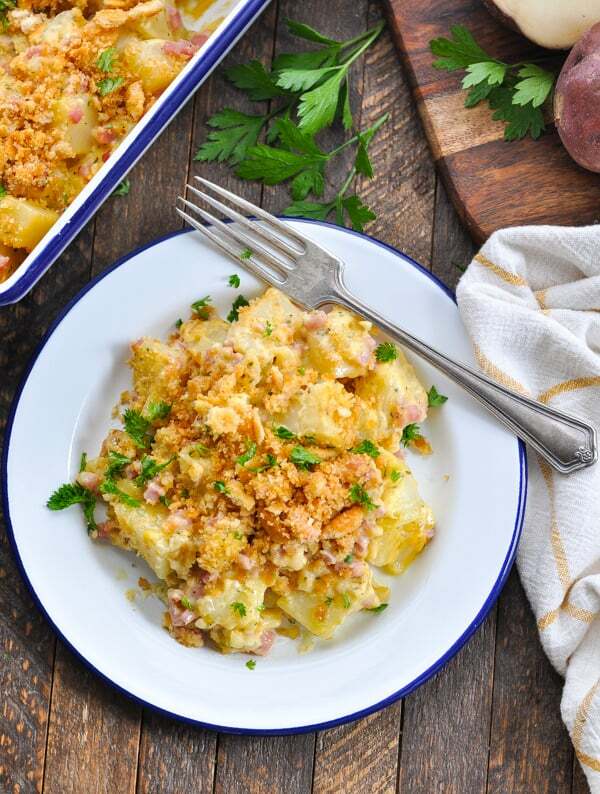 Seriously, is there any better combination than cheesy potatoes with ham? 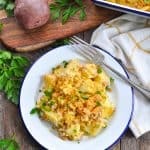 Whether you serve it for brunch with eggs or on its own for a cozy dinner, this potato casserole is one easy meal that your entire family will devour! 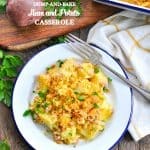 If you love the taste of a casserole, but you don’t love the hassle of multi-step recipes that require cooking the meat, veggies, pasta, or potatoes before they go into the dish, then you’re going to love this idea. You don’t have to boil the potatoes first or even pre-cook the ham. 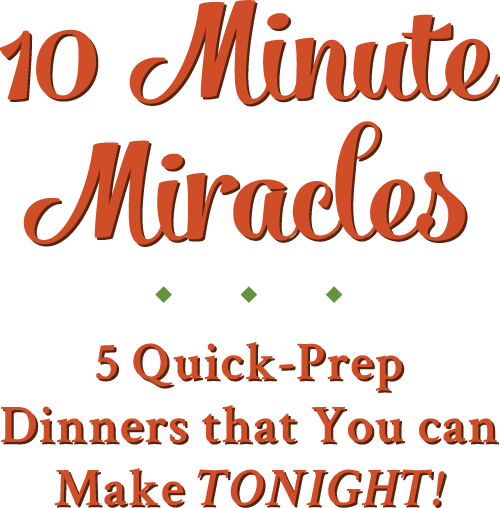 You can certainly use leftover ham if you have it, but I typically just purchase an 8-ounce package of diced, cooked ham (which you can find near the lunch meat or pork in any grocery store), and save myself the prep work! First, peel and dice your potatoes. 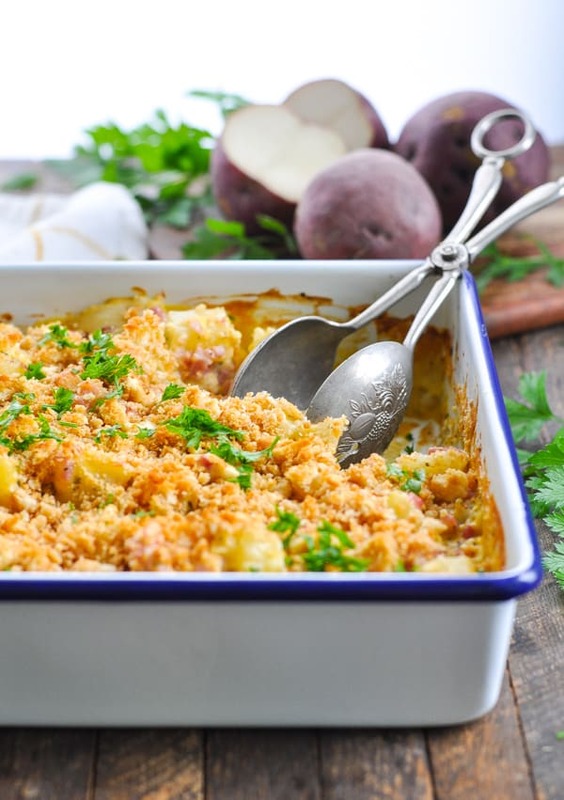 Make sure that the potatoes are cut into bite-sized pieces, because the smaller cubes will cook quickly in the oven. Then it’s time for the cheese sauce. 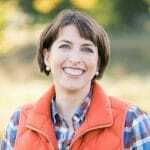 You’ll mix together a can of condensed cheddar cheese soup (I use Campbell’s Healthy Request), a block of softened cream cheese, and a 1-ounce packet of dry ranch dressing and seasoning mix. 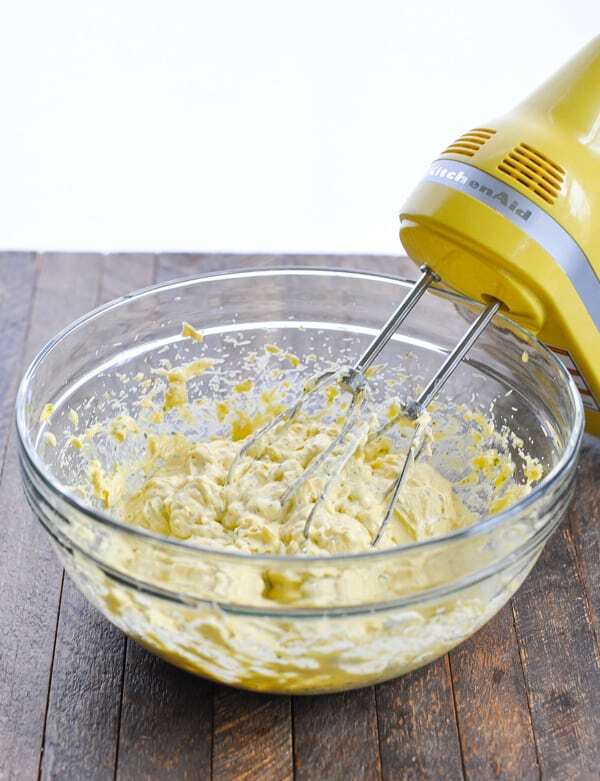 I like to use a handheld electric mixer to make sure that my sauce is really smooth and fluffy, but you can also just use some elbow grease with a wooden spoon! 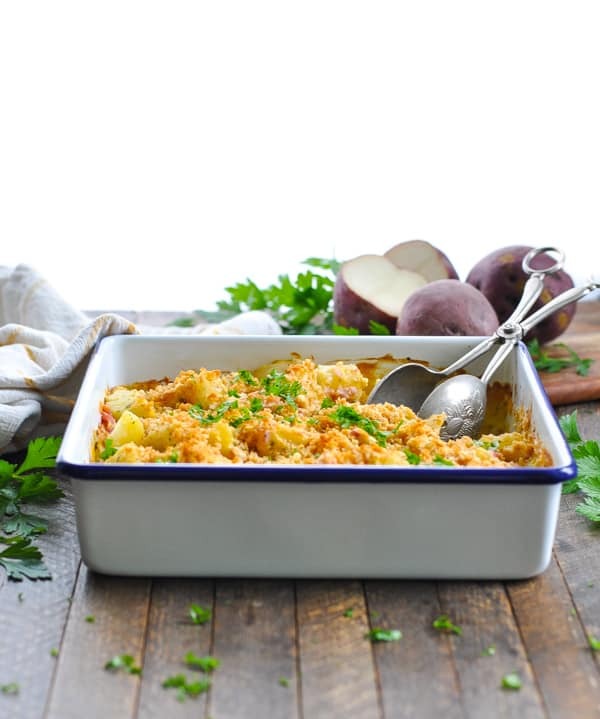 Combine the diced potatoes and the cheese sauce in an 8-inch or 9-inch square baking dish. The dish gets covered with foil and placed in the oven for about 30 minutes. 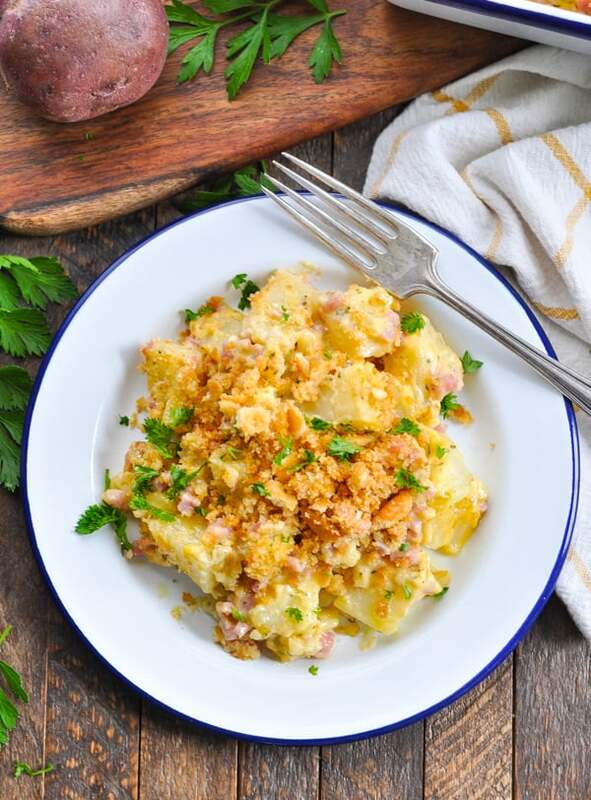 When the potatoes are just fork-tender, you’ll stir in the package of diced ham and finish the top of the casserole with buttered cracker crumbs. 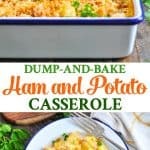 Place the dish back in the oven for about 5-7 more minutes – just so that the delicious topping can turn golden brown – and your Cheesy Ham and Potato Casserole is done! 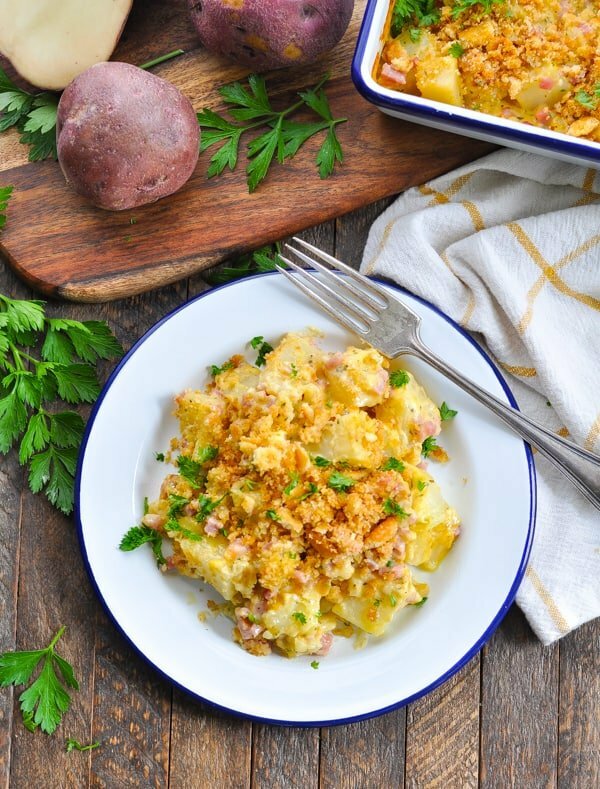 This totally reminds me of the ham and scalloped potatoes that my mom used to serve us when we were growing up – but it’s WAY easier to prepare. I hope that you love it as much as we do! Spray an 8-inch or 9-inch baking dish with cooking spray. Place potatoes in the prepared dish. In a separate bowl, mix together cream cheese, ranch seasoning, and condensed soup until completely combined. 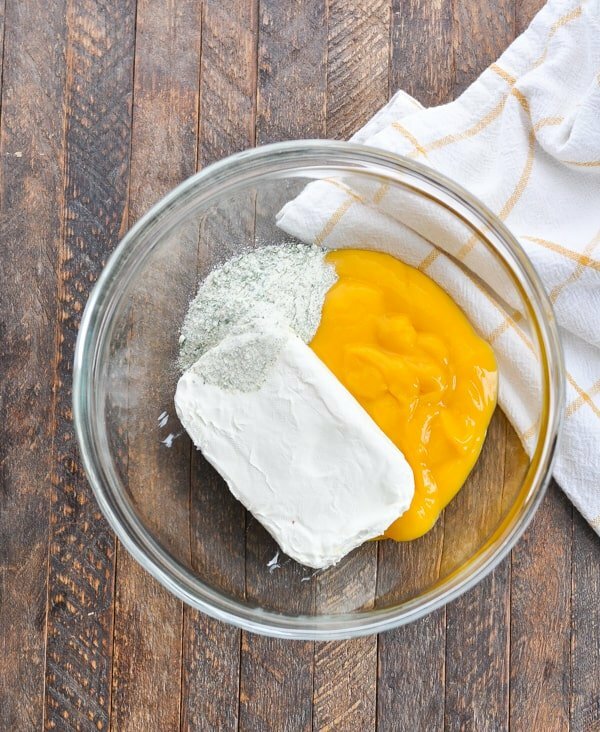 I use a handheld electric mixer to make sure that the cheese sauce is smooth. 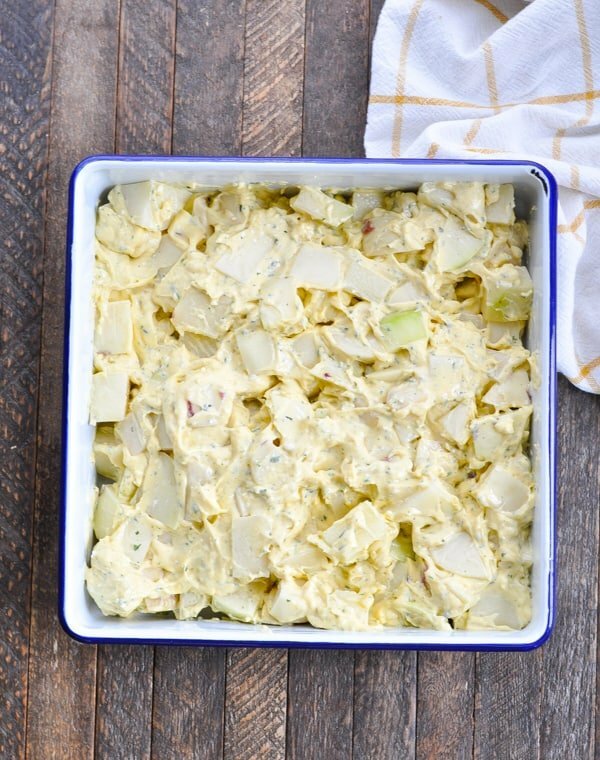 Pour cheese sauce over potatoes and toss to combine. Cover dish tightly with foil and bake for 30 minutes (or just until potatoes are fork-tender). You don’t want to overcook the potatoes and make them mushy! NOTE: I used an enamelware pan, which tends to cook faster than other types of dishes. 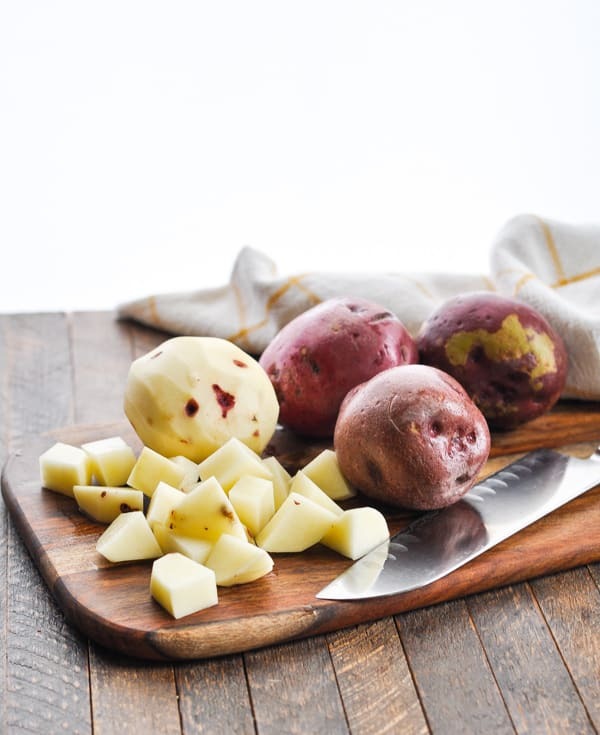 If you're using a glass, ceramic or heavier nonstick metal pan, you will need to increase the baking time for your potatoes. They may require up to 45-55 minutes to become tender, so just check on them periodically and pull them out when your dish is ready. 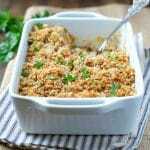 While the potatoes are in the oven, prepare the crumb topping by combining cracker crumbs with melted butter. Remove potatoes from oven. Stir in ham. Sprinkle buttered cracker crumbs over top. Return dish to oven for 5-7 more minutes, or until topping is golden brown. Garnish with fresh parsley just before serving. Cooking Just for Two? Cut the ingredients in half and bake in a small dish. The rest of the instructions remain the same. Want to Prep Ahead? 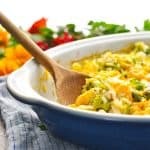 You can assemble the casserole through step 5, cover with foil, and keep in the refrigerator for a few hours (or up to overnight) before baking. 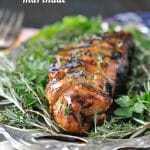 This was such a great quick recipe! Everyone had 2 helpings! I used butter noodles instead of potatoes, added peas and used crushed Breton crackers on top. I was skeptical about the Ranch mix but it totally gave it flavour. I usually cut my potatoes into cubes and microwave them for 5-7 minutes so they are partially cooked and then add everything and bake for 30 minutes. I love the flavor and texture of russets, but they take more cook time and the microwave pre-cook makes it all work. This was a total fail for a mom that needed it to work. My tiny bite sized potatoes have been cooking for well over an hour and I’m now making an alternate meal. The potatoes are still hard! Alternate meal cooked fine so it’s not the oven. Definitely recommend cooking the potatoes first!! Ya know most recipes can be salvaged by adding things or taking thing out but there is no hope for this, it is flavorless there is too much cheese and the ham to potato ratio is off. I apologize if I offended anyone with my comment.